Our crowd-fund has now finished. Huge thanks to everyone who has supported the film. If you'd like to help, please email and we can send you details. All rewards are still available ans we are, of course, happy to speak about other ways we can work for change together. "Meeting of Eastern and Western Scientific Wisdoms" is an original feature length documentary film about the inauguration of the first research and studies center dedicated to the meeting of Western and Eastern scientists in India, named Tarab Ling. Because of exchanges between those two cultures we already have made incredible discoveries on brain plasticity or in astrophysics. At the heart of the film will be the 3 days inauguration of Tarab Ling and the meeting with all those scientists coming from different countries and backgrounds towards this very special place in the North of India, accompanied by thousands of years old rituals. 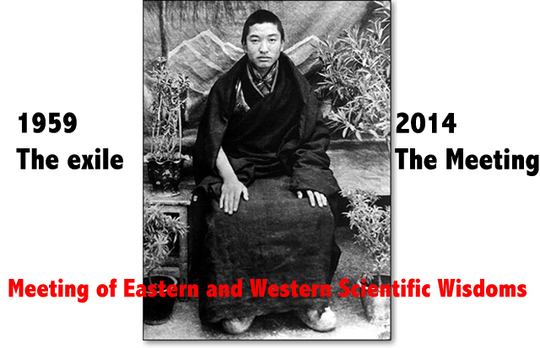 In a few words - The story behind the documentary movie "Meeting of Eastern and Western scientific wisdoms"
Tarab Ling inauguration appears as a historical moment. For the first time in India, a center dedicated to the meeting of contemplative and modern sciences is opening. It was Tarab Rinpoche great vision and desire to see the manifestation of this center. From the very beginning, Rinpoche had a clear vision of the opportunity for interdisciplinary collaboration. But it was also in the heart of Tarab Rinpoche’s teachings to share the most subtil understanding of mind and matter in a way that should be understandable for anyone. 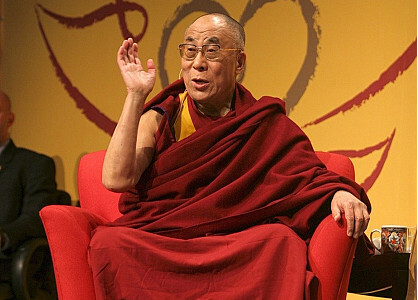 Most of us are not scientists neither buddhist. We would like to make a documentary that would allow anyone to understand all those most important teachings that are going to be shared during this inaugural conference. To do so we are convinced that we would need some time with the participants in order to understand their background and work. Enjoying the change of scenery, the force of nature, the power of the elements we want, like children, to connect with the human behind every scientist/scholar who embarked on this adventure. 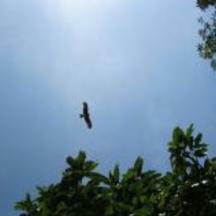 To understand the subtlety of words, it seems to us fundamental to live, breathe, see the world as they see it. We want to take some time to discover new inner and outer landscapes with them in a long dreaminess, a descent into the heart of ourselves, tearing all the veils of interpretation, whether cultural or social. We want to build be it in silence or in words a universal language of understanding of reality and human. The rituals around this inauguration will come as a poetic act to give sense to this whole project. In addition to the documentary, which will be produce as a DVD, we want to make one DVD per participants to the conference. In those DVDs, you would find the entire presentation of the scientist during the conference and question/answer sessions plus some bonus of images, interviews, sharing we would have had with him/her around the conference. All DVDs will be available in English. I will suggest that how science relates to wider humanity is no longer of academic interest alone. This question must assume a sense of urgency for all those who are concerned about the fate of human existence. Why do we want to make such a documentary ? For the first time, in India, a research and study center will be focused on the meeting of scientific knowledge whatever their background. Science is the main paradigm today to understand the nature of reality and develop a knowledge which helps to improve the life of human beings, sentients beings and the planet itself. The scientific method is based on empiricism, technology and 'objective' observation, and the analysis of an outer person. But the main scientists realize today that introspection and contemplative practices can allow to go beyond the limits that impose the necessity of an outer observer, to reach more and more subtle levels of understanding of what reality is. Tarab Tulku Rimpoche was one of the most recognized scholars in Tibetan Buddhism, and he was, throughout his life, a scientist. 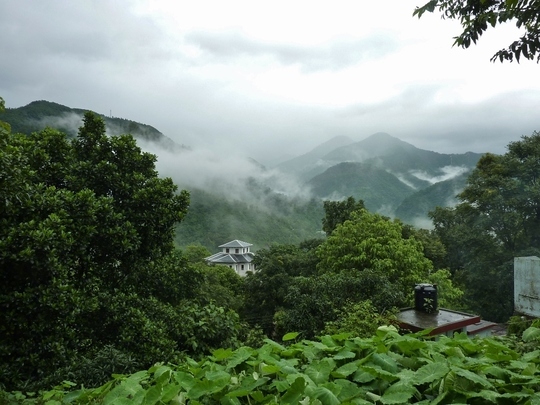 He took advantage of every moment, every circumstance, every meeting to deepen his understanding of reality, of mind, of the origin of suffering … For more than forty years, Rimpoche had to live in exile, far from his culture. Certainly thanks to this exile, he understood that at the heart of the Buddhism, once we are going beyond all cultural veils, there is a deep and subtle knowledge of what we are as human being and a way of universal liberation. And living in the West for so long, he could understand that our sciences are heading towards the same knowledge. He, who did not want to build of place to share his teachings, then had the intuition that he should build a place where scientists from everywhere could come to exchange, to grow, to share, to understand and to spread their understanding of mind and reality. 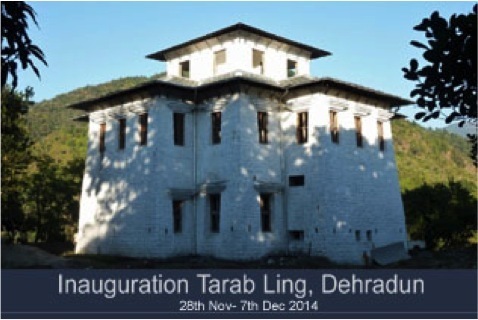 We want to make a documentary around the inauguration of this place, this palace of the knowledge, this meeting of sciences situated in North of India: Tarab Ling. During three days scientists of the whole world and Tibetan scholars agreed to go beyond usual borders, to break cultural and scientific frames, to open to others to share, exchange, their understanding of the world. Of course none of us (well maybe few of us are but we are speaking for the vast majority of people reading those lines) are neither a big scientist, nor a buddhist scholar, nor a great yogi. So we could think that we don't have the abilities to really understand what is going to be shared during those meetings. And it is actually the reason why we got this documentary in mind: we want to make it understandable for any of us. Sandrine, who got the idea of the project and gathered our littlre team around her shares: "I was around 20 when I met Tarab Rimpoche for the first time, and if this meeting had such an impact in my life, it is because he had put all his energy for years and years into deconstruction of traditional buddhist teachings to make it understandable for someone like me, born in a traditional French Catholic family, having no links to eastern knowledge. This documentary will follow the same line. It's now almost 20 years that this eastern view of mind and phenomena is nourishing me, even though all my education, culture, basic understanding were build in the western view. I am a meeting of eastern and western views, this place is a meeting of eastern and western views, this conference will be a meeting of eastern and western views." The four of us believe that if we are getting closer to each of the participants, understanding their background, their life, their world, then we could understand better what they are sharing. We want to share their curiosity, bits of their life, in order to understand the stone they are bringing to deconstruct what we are believing in as being reality. Where are they from? Why did they agreed on coming from Sweden, the States or Dharamsala to share with scientific who don't have the same langage as them? How are they experiencing this journey? How are they seing this place we are inaugurating? Understanding the humans, we'll understand the world they are living in, a world built on their deep understanding of reality. Understanding the humans we'll be able to use what they are bringing to better our daily life. This movie invites you in an outstanding journey, a physical journey, a spiritual journey, a cultural journey, a journey towards the heart of matter and ourselves. Will you agree to embark on? II met Tarab Rimpoche at the end of the Nineties. Immediately moved by the accuracy of his teachings, this meeting turned my life and my plan of career upside down: Doctor in Sociology and Political Science, I then focused on the human and his psychology. Since the beginning of 2000s', I am very invested in those teachings,first of all and always as a translator then as a link of transmission. The inauguration of Tarab Ling and the conference created for the occasion are for me the manifestation of Tarab Rimpoche's vision: looking for, in the heart of all those sciences, that which is explaining who we are, as humans, and how we are creating our reality, what is reality, from where is the suffering manifesting. It is only if we are Captain on board our own ship that we will be able to go towards happiness, and we need to understand how our ship functions if we want to achieve this. We are all embedded in interpretations, cultural beliefs which are so difficult to demolish. It is only while exchanging with others, that we'll be able to reveal what we are in depth,and how we build our reality. I am not a scientist, I am not a Buddhist scholar,just a human being who will seek through out this project, to understand what there is behind the words, what those eminent scientists tell us about who we are, and how they can enable us to built a way towards our happiness. Director of photography and cameraman on many short and feature movies since the Eighties, with this project I find back my young loves: working with a very small team to meet human, ordinary and extraordinary. I have been, since the very beginning, moved by the ambition of Tarab Ling project: building a place to develop bilateral exchanges and contributions between our scientific discoveries and the Eastern understanding of the world. I have followed this project for several years, and had the idea to carry out a documentary on the inauguration of this place and the inaugural conference which will gather very-well known Western scientists and Tibetan scholars. Far from mastering the subtlety of the theoretical contributions of the scientists, I want anyone to benefit from the treasures that are going to be shared, at a simple human level. This is my aim with this documentary. I am sure that anyone, without being neither Buddhist, nor scientific, can use those great discoveries to change his/her dailylife. Trained as a psychologist and anthropologist, I have turned towards directing short movies and documentaries, and more photographic and artistic projects since several years. I was lucky to meet Tarab Rimpoche 12 years ago, alas short time before his death. And I was impassioned by the project of this great Master: to question our two cultures on the questions of the suffering, Reality and to develop what they could bring one to the other. He left us a complex and luminous teaching which could be seen as the base of the techniques of Mindfulness. Tarab Rinpoche is not here any longer but another project of his life manifests: to build in India,Tarab Ling, a place of exchange between cultures on the questions of human, suffering, compassion… Being part in the realization of a documentary on this event is for me a marvelous occasion to continue and bring those questions to all humans. Head film editor, I have been working in the intimacy of dark rooms for almost 20 years. I collaborated to a lot of projects, editing lengths or short films and documentary movies. It is always with great pleasure that I put all my artistic, technical and human knowledge so that a movie can manifest. On this documentary more specifically, I feel more personally implied. I indeed had the occasion to discover the teaching of Tarab Rimpoche, great Tibetan master, several years ago, and those teachings went right in my heart. I am thus delighted to take part in this adventure aiming at making understandable those deep understanding of our being, thanks to which we can hope to live better. The team will shoot the documentary in North India, where Tarab Ling is built, nearby Dehra Dun, capital of the state of Uttarakhand. Nous will shoot sequences nearby Tarab Ling also, either in the lively city of Dehra Dun, or in the fabulous landscapes around the temple. 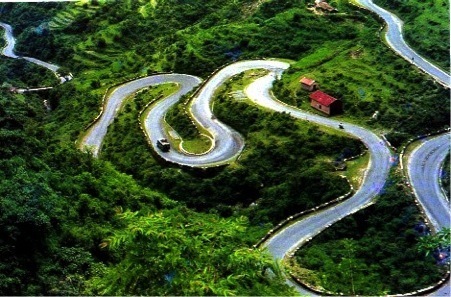 We may also go upwards Mussorie, fabulous station, 38 kms from Dehra Dun, from where there is a great view on the Himalayas. 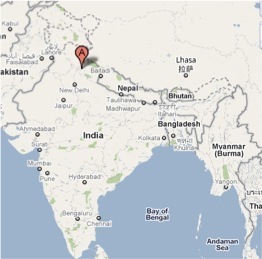 We may also go with one or the other participant to Rishikesh or Haridwar, near Ganga. Being there, in silence, with those great scholars in those beautiful sites. We believe in this project so much that we already have put some money in the movie equipment we'll need to shoot this documentary. We bought a Canon 5d mkii so that we can shoot a professional movie, we'll also use our little HD video camera to shoot the conferences, and we'll use our own softwares and computers to edit the movie. But if we want to make a nice movie, if we want to have an equipment that would be needed to shoot sequences in the best way, we need your help. All your contributions will only be used to buy or hire equipment. We'll hire part of it in France to improve the abilities of our 5D and to have a second video camera to get several static shots during the conferences (as we won't be able to move) and we'll hire part of the material directly in India (all the electrical equipments and lights). The money will also be used to pay for the transport of the movie equipment, the customs and finally for the production of 500 DVDs. Our needs are a total of 5956 euros. We are aiming to collect at least 4500 euros (on which 4100 euros would go for us and the rest for the crowd funding platform), because if we are not able to reach that amount, we won't get a dime. If we reach only 4500 euros, we'll hire less equipment for the 5D and we'll try to reduce the forwarding charges. If we reach to 6500 euros (150% of the collect), we'll be able to hire all the needed equipment. If we reach to 9000 euros (200% of the collect), we'll be able to invest in a steadycam to shoot camera movement and reach places that one cannot shoot normally. And of course we are all giving our knowledges and technical, artistic or natural skills for free in this project that is giving us extra energy. Big big thank you to you all in advance for your generosity and support. We'll keep in our heart all that you gave and we'll make for you the best movie we can! 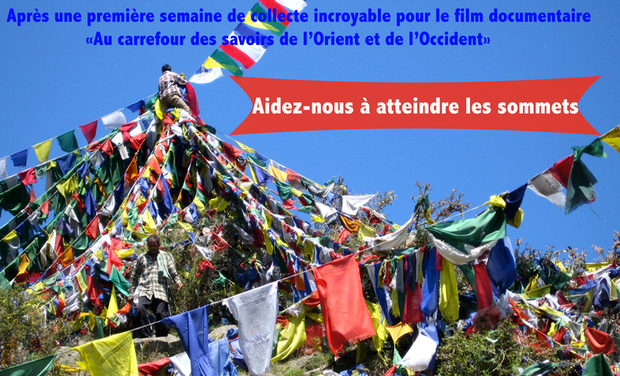 For 20 early birds: A big big thank you + your name and picture will appear in the end credits + The DVD of the documentary "Meeting of Eastern and Western Scientific Wisdoms"
A big big thank you + your name and picture will appear in the end credits + The DVD of the documentary "Au carrefour de l'Orient et de l'Occident"